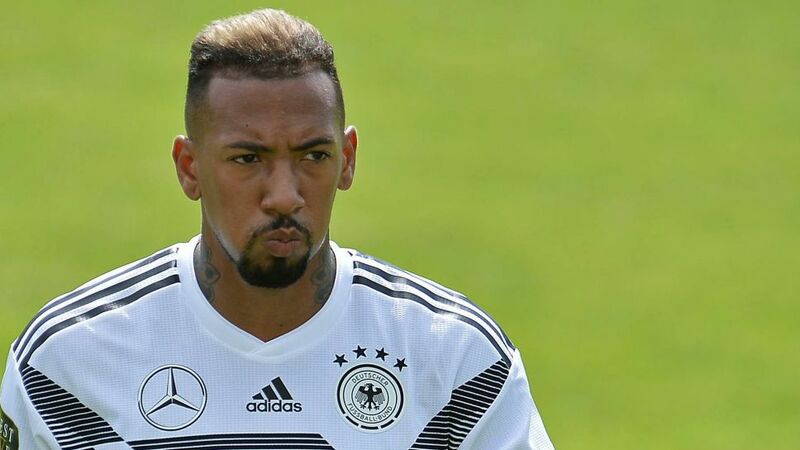 In another life, Jerome Boateng might have been sending down 130mph aces at Roland Garros right about now. Instead, he's preparing for Germany’s FIFA World Cup defence in Russia. How will reigning champions Germany fare on the big stage? How did he get into football? What makes him tick? And what’s left for him to achieve? "When you’ve already lifted the trophy and you have the quality, then you really want to win it again. I have only one objective in Russia: to be world champion. But as we saw in the March friendlies against Spain [1-1] and Brazil [0-1], we’re not the only ones and nothing will be handed to us on a plate. We need to play better than at Brazil 2014. The teams at the 2018 World Cup are even better than they were in 2014. Individually, we’re better, but that doesn’t automatically mean we are better as a team. Team solidarity plays a big, big role in tournament football." "Sometimes it’s being in the right place at the right time, but luck also plays its part. If Arne Friedrich hadn’t got injured in 2006, I might not have got the chance at Hertha Berlin. It might have taken longer, maybe I’d have taken another path. Who knows? I wouldn’t have even had the opportunity without talent and discipline, though. When you get the chance, you have to make the most of it." … the pros and cons of being 6'4"
"I’ve always been one of the biggest in my teams without being so big that I had to listen to silly comments all the time. Looking back, I’m pretty happy about that. I just grew up quickly - that’s why I had knee and back problems. On the one hand, it wasn’t easy. On the other, the experience was invaluable. I learned early that I had to look after my body in order to prevent injuries. I started doing preventive work, namely specific back exercises. It’s paid off and taught me that that you have to work on all weaknesses - not just weaknesses as a footballer." "One thing is for sure: if you make a mistake as a defender, it often has far worse consequences than, for example, missing a chance to score as a striker. Most of the time, mistakes in defence are punished. You’re singled out as the one at fault and your actions are criticised publicly. But that’s the sport. You know that as a professional footballer. And believe me: strikers have to deal with pressure. It’s always there - for everyone. You get used to it. When I started playing in front of sold-out crowds, it’s not like I thought: ‘Cool, a lot of people are here, it’s no big deal, relax.’ It wasn’t like that - whether it was my Germany debut, first time in the UEFA Champions League or at the World Cup. Of course I felt the pressure, of course I was nervous. But, come kick-off, I always managed to turn the nerves into positive energy, so that I could enjoy the game. I still get nervous today, but maybe it’s controlled nerves because I know what’s coming." "I’m not media scolding, but I’m not going to lie either. I don’t know who does the player ratings in some papers sometimes. I have to question whether every sports journalist is truly able to judge if a defender under pressure has done a good job of playing the ball out from the back. I’m not judging, but I do question it. I find it quite annoying. If we play well as a team, the strikers score and the defenders do a good job at the back, the defenders don’t get the credit and are ignored. If we lose and the strikers haven’t scored, it’s the defenders who are questioned and have to justify themselves after the game. It doesn’t add up. I realise that strikers and midfielders are generally in the spotlight more, and I don’t have a problem with that. But if you know football, you can recognise when a defender has played well, even if a striker scores twice in the same game. You shouldn’t forget that." "I’ve experienced everything at Bayern. We’ve won everything there is to win in club football. And a footballer’s time is limited. I don’t have to kid myself, it’s not 10 years for me any more. But I’m convinced my body has more to give, that I can still improve as a player and play at the highest level for a good few years yet. I’ve slowly come to the point where I’m asking myself: What haven’t I achieved yet? Do I want to keep proving myself at the same club with the same old objectives? It’s not just about feeling a certain way in one place. It’s about personal challenge. These aren’t just career questions, they’re life questions. I don’t think anybody can avoid them. At the end of the day, it’s the questions that drive you as a human being."